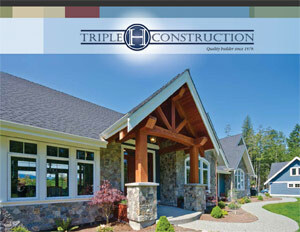 Custom Home Construction: Build your family dream custom home from the ground up with Triple H Construction. Our professional framing crew has been servicing the mid-island region of Parksville, Qualicum Beach and Nanoose Bay for over 35-years. With Triple H home builders, we work with you and whatever ideas you have to make your custom home a reality! You can bring in your own custom home plans or use one of our professionally designed master plans with plenty of storage. You can have a house built on your own land or choose a lot from the many we have available! Competitively priced, give us your custom home ideas and take the first step in making your dream home become reality!! Home Renovations: Need to upgrade your home? No job is too big or too small. We can help you upgrade your home no matter if it's a custom family home, townhouse / condominium, or character home. We are home builders who specialize in framing, kitchen renovation, bathroom renovation, flooring, specialty guest or suite design, storage solutions and more! Let us help you make your home feel brand-new! Real Estate: Looking for a lot to build your new home? Or maybe looking for some investment property? Look no further than Triple H Construction. A one-stop-shop for your custom home building and property needs. Specializing in Parksville, Nanoose Bay, and Qualicum Beach real estate, we can help find the property that's right for you and build your dream house with it! Look at our Property Listings page here to see what we have available now.